Nature stirs emotion in everyone, whether it is the calm and quiet of a red leaf fluttering to the ground in a light fall breeze, or the thunder of an ocean wave crashing against the rocks. Translating these emotions into something tangible is often a difficult task, but one that is tackled head-on by Simcoe County artist Janine Wheeler in her new exhibition (Through) Thick & Thin, an ongoing exhibition at the Aurora Cultural Centre. Although Ms. Wheeler’s abstract paintings have been on the walls of the Church Street School since August 11, the exhibition formally opened Wednesday night with the artist on hand to share her work with art lovers from York, Simcoe and beyond. Added Curator Stephanie Nicolo at Wednesday’s opening: “Those are beautiful words and the best way to describe what we are surrounded by. Jeanine, it has been a pleasure to work with you, responding to your practice, to the nature of your exploration and your goals. The artwork here are timeless paintings, alas more like drawings of the movement of time, captured forever for us to ponder, meditate, and many times lose ourselves into their sublime nature. 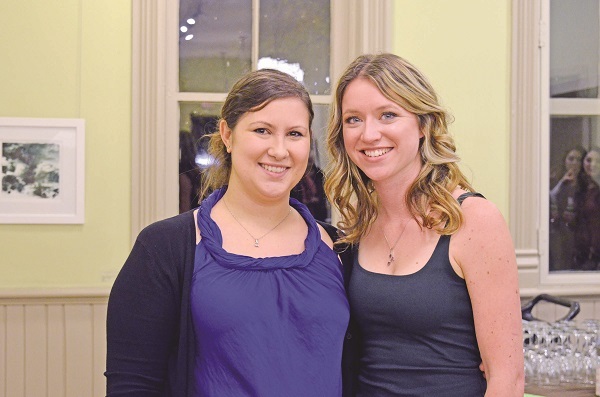 Ms. Wheeler, who hails from Utopia, a small community between New Tecumseth and Barrie, said she finds her inspiration in the world around her. “The palate has changed a little bit with the new works,” said Ms. Wheeler when asked to give a bit of a teaser into things to come. (Through) Thick & Thin runs at the Aurora Cultural Centre, 22 Church Street, through November 24.